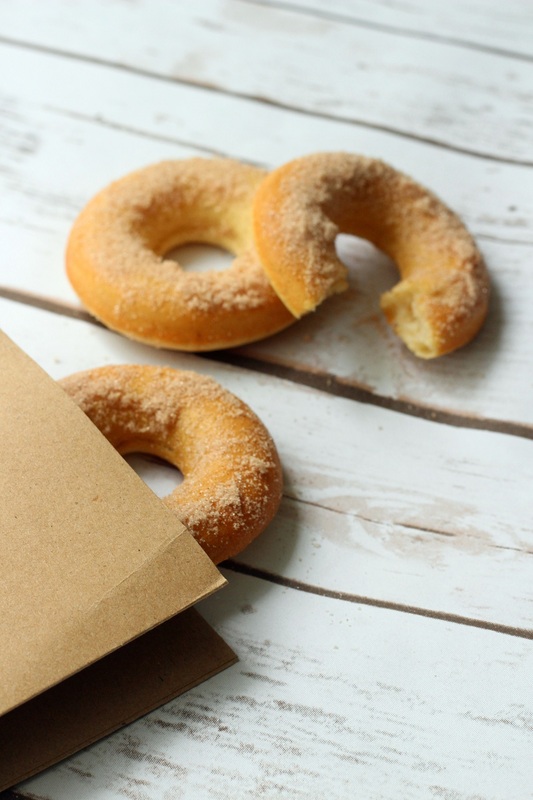 These Baked Cinnamon Doughnuts are the perfect way to start your weekend with a cup of coffee. A couple of years a go I would have been annoyed for days that the weekend hadn’t gone precisely to plan but if it’s one thing I’ve learnt over the years its that nothing is ever perfect. I always make grand plans in my head that rarely turn out how I want or expect. As for that rosy glowed ideal breakfast in bed…yeah that just wasn’t happening today! If like us you don’t feel like being an early bird on your weekend, it doesn’t mean you can’t still make baked cinnamon doughnuts…just have them for lunch instead like we did, or perhaps as an evening treat with a cup of cocoa in front of the telly? Now before I share the recipe I do actually have a confession to make. Of course one benefit of this recipe is that baked cinnamon doughnuts are healthier than the deep fried variety. (Woohoo!) But that’s not the only reason why I prefer to have my doughnuts baked. I hate deep frying things with a passion. It actually scares me. I am always petrified that I will start a fire. Irrational, yes. But hey, that’s just me! 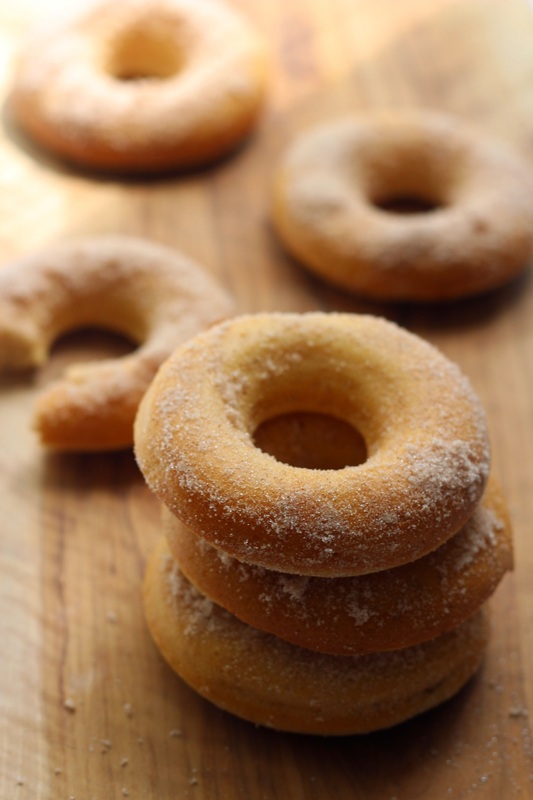 If you too like to avoid large quantities of oil at high temperatures, perhaps you want to make these with your children, or you’re looking for a healthier doughnut variety, then these Baked Cinnamon Doughnuts are for you! These Baked Cinnamon Doughnuts are the perfect way to start the weekend. Pre-heat your oven to 180C and lightly grease your doughnut tins with a little vegetable oil. Next, add the other dry ingredients and stir until thoroughly mixed together. Add the milk, yoghurt and eggs (beaten) along with the seeds from the vanilla pod. Stir until the wet ingredients and dry ingredients are combined. Spoon the mixture into your doughnut tins or spoon the mixture into piping bags before piping directly into the tins (this will help you avoid making a mess!) Each hollow in the tin should be roughly 3/4 full. Bake in the centre of the oven for 10-12 minutes until golden brown and springy to the touch. Cover a plate with the cinnamon sugar and immediately turn the doughnuts out on to the plate. Coat liberally with the sugar and enjoy while still warm! The doughnuts themselves are the perfect balance of sweet and savoury and the nutmeg gives them a real warming, hearty flavour. They are also the perfect texture: light and fluffy. Rolling them in cinnamon sugar straight after the come out of the oven gives them the hit of sweetness that you crave when you wake up after a long lie in. The perfect lazy day breakfast. Hot mug of coffee optional! Also, please do note that this batter makes A LOT of doughnuts, if you’re just looking to feed your family for one breakfast then most definitely halve it. I’ve kept the recipe big for those of you who like to treat more than your other half to a freshly baked breakfast. Some of the Baked Cinnamon Doughnuts you see here will be making their way to work with Jon tomorrow and he’ll be sharing with his colleagues. My favourite thing about these doughnuts though is that they are nice enough to bake on special occasions, but not so naughty that you can’t enjoy them as a regular Sunday morning treat! What do you think of these Baked Cinnamon Doughnuts, can a healthy version of the deep fried treat still taste as good? Wow these look amazing! I hate deep frying too, there’s so much mess and grease! Awww thank you 🙂 I’m glad I’m not the only one!!! I’m going to have to give these a go during half term. I’m presuming you can freeze the surplus and defrost? I’m going to have to give these a go this week. I’m presuming the surplus could be frozen and defrosted? These look amazing!! Gorgeous pictures and lovely doughnuts. I like them best baked, too. These look amazing. Trust me you are not alone with your fear of deep frying, really would just rather not! It seems quite a few people agree with me about deep frying who would’ve thought :-p I better get making more baked doughnut recipes! Thanks Eleanor!